This list is by no means comprehensive, but it shows most of the major attacks. We present this list to the Late Prof. Dr. Shawky Karas the father of the Coptic movement in the Diaspora and the founder of the American Coptic Association who departed from this world on 24th October 2003. The Copts are always indebted to him. 6/11/72 El-Khanka Cairo The Significance of this attack stems from it being the first attack on Copts after a relatively long period of peace since the attacks on Christians in Suez in 1951. Following El-Khanka attack a full report of the causes leading to persecution of Copts was done by MP Gamal El-Otifi, this important repot has never seen the light and was hidden by the government. In El-Khanka attack a Christian services building which used to host prayers and Mass was burnt down and local Christian shopts attacked by local mobs incited by local Muslim fanatics that Christians should not conduct prayers in unrecognized church building. "External Link in Arabic"
1975 Bitakh, village Sohag Muslim fundamentalist attacked and burnt parts of the church after looting. Mar 78 Province of Cairo Minya and Assiut Several churches were burned. Abo-Za'abl - Cairo a Church was burned. in the city of Samalout a Priest was attacked in Samalout District. 6/1/80 Alexandria Several Churches were attacked. A bomb was thrown on worshipers during Christmas Mass at Mar Girgis church Sporting. March 1987 Sohag Civil and sectarian unrest erupted after rumors an accusations by members of El-Gama'a Al-Islamia, that Christians burned Quotb masque in the city of Sohag. They enticed Moslems to burn St. Mary Church which adjacent to the masque in question. Sept. 1987 City of El- Minya Skirmishes between by members of El-Gama'a Al Islamia and Copts caused by the attack of by members of EI-Gama'a Al-Islamia on a musical gathering. Sept. 1988 Rode El- Farrag The Rode El-Farrag Church was completely burned and destroyed. Nov. 1988 Shobra - Cairo An explosive charge was thrown at St. Mary Church during a wedding ceremony. January, 1989 El- Minya Violence and random attack on Copts by members of Al-Gama'a AI-Islamia. Dec. 1989 City of Assiut Violent Riots and attacks by members of El-Gama' Al-Islamia against Copts. 2/3/90 Abu Qurqas Several coordinated attacks on Christians and their properties resulting in the burning of a factory belonging to Ashraf SAAD, A Chemist belonging to Dr Hanna Kerolos, and another chemist owned by Mamdouh Faragalla, a hospital own by Dr Mourad Danial, shops belong to Christians malak Samy Maher Bahig also attacked and destroyed Khalas El-Nofos church, and Mari Guirguis Chruch. 12/5/90 Ain Shams - An explosive charge was thrown at St. Mary Church. Feb 1991 Bani-Swief Three pharmacies owned by Copts were set on fire. 04/05/91 Dayrout Assiut The murder of 13 Copts in their fields in Manshiet Nasser, a doctor “Sobhi Nagiub” a teacher Mansour Kedis in front of the primary school pupils. 20/9/91 Embaba - Several Copts were murdered and destroyed their homes. Apostolic Church Basrawi Street and Presbyterian church El-Ward street were burnet down. Jan 1993 Dayrout - The murder of a Coptic man. June, 1993 Sohag A clash between a Moslem and a Christian families resulted in a killing of 2 Copts. 22/07/93 Assiut The Murder Dr Fawzi Boshra Mikhaiel at the hand of Islamic radical militant (he was a Gynaecologist, was ordered to stop practising to avoid examining Muslim women) he was killed in cold blood in retribution for continuing to practice as a Gynaecologist. August, 1993 Dayrout The murder of the detention center hospital Coptic manager, on the hands of El-Gama’a Al-Islamia. September1993 Dayrout The attack on the Anglican Church by 3 Islamic radicals. Oct 1993 Assiut The murder of a Coptic liquor store owner and his son. Oct 1993 Dayrout he murder of a Coptic pharmacist and wounding others in an attack by Islamic radical militant. Oct 1993 Assiut The murder of a Coptic policeman. 12/2/94 Telwana, Menofia The murder of Nema Malak Shafik by the son of the village head of local police Usam Talat El-Garf. 12/3/94 El-Dair El- Moharaq Assiut An armed assault resulted in the death of 5 Copts. Monk Aghabious El-Moharaqi , Monk Noor Benyamin, Safwat Fayer, Labib Saeed, and Seif Shafik visitors , The assault as carried out by Gama'a Islamia radical militant group. 4/10/94 Mir, El-Qusia Murder and burglary of two jewelers in their home next to Mir police station. 12/2/96 Kafr-Demiana El-Sharqeya Following rumors spread by the Muslim guard of St Mary church “Shabaan El-Deeb” that the priest is building a room inside the church, this was followed by another rumor from the nearby mosques that the guard is being killed by electrocution by the Copts, an assault on homes and store shops of Copts, resulted n looting and destroying the whole Christian village 42 houses, shops, animals, crops and its Church. 20/2/96 Sahel SelimAssiut Three gunmen, alleged members of al-Gama al-Islamiya, reportedly attacked a house in the village of Sahel Salim and killed two Coptic Christian brothers, Nabil Wasat Bashta, aged 29, and Girgis aged 13. 24/2/96 El-Badary Assiut The murder of 5 Copts in Ezbet Al-Akbat, El-Badary. 12/2/97 El-Fekrya Abo Qurqas An armed assault on a Coptic church during Sunday school service, resulted in murdering 10 parishioner inside the church. The following day 3 more Copts were killed near Kom El-Zohair Village. 23/4/97 El-Minya The murder of 2 Copts, one of which is a policeman no one arrested by the police. 13/3/97 Ezbet Daood Nagaa Hamady The murder of 8 Copts in Ezbet Daood, attack took place at random and on a tailors shop, 4 Muslims also were killed. 14/8/98 El-Kosheh I Sohag The murder of 2 Coptic youths in a homicide case and the wounding of 2 other Copts, was dramatically evolved into a sectarian attack on Copts in the village It resulted in the arrest and torture of 1200 Coptic children, women, elders and men on the hand of the local police authorities, prevent charges on the Moslems perpetrators of the gruesome homicide of the Copts. 11/10/98 Sohag Arrest and Charge of Bishop Wessa Because of their reporting of the “El- Kosheh Incident” to human rights NGO’s, Bishop Wessa of Balina and two Coptic priests have been arrested and accused of spreading matters damaging to nation unity and social peace (Article 86 penal code), using religion to incite strife and damaging to nation unity and social peace (Article 98 penal code), attempting to influence the outcome of a court case and investigation (Article 171, 187 penal code), delivering an insult or criticism while carrying out their duties as priests (Article201 penal code), and presenting false information in an investigation (Article 145 penal code). 9/5/1999 Sohag After an investigation by the Egyptian government of the “El-Koshuha Incident,” charges of brutality and torture against the four police officers were dropped and the case was officially closed. This was despite the large volume of evidence to the contrary that is said to exist. In addition, each of the four officers were given cash rewards of 1000 Egyptian pounds for their cooperation in the case. 10/12/99 Awlad Toq Sharq, Sohag A group of Muslim men attacked the Church of Mare-Guirguis. The armed men fired randomly at the building, which was being renovated. The attack caused parts of the building to collapse and damaged a crane used in construction. 13/12/99 Assiut A group of Muslims attacked construction workers who were building a fence at the First Evangelical Church in Assiut. The workers were forced to leave and were threatened with death if they resumed their work. 28/2/00 El-Tor Sinai Egyptian security forces from the State Security Intelligence (SSI) raided a church service at the St. Mark Coptic Orthodox Church in Al Tor, southern Sinai. The worshippers were forced outside and the doors were welded shut. The security forces also damaged the marble Sacrament table and stole the Holy Altar vessels. Several Christians sent telegraphs to the President, complaining about the incident. They later found out that none of their telegraphs had been sent as the post office officials were forbidden from doing so by the SSI. 7/6/00 Cairo State Security Intelligence officers arrested Christian Aziz Tawfik Rezkalah on the charge of preaching the gospel to a Muslim. This was Mr. Rezkalah fourth arrest in four years. During each arrest Mr. Rezkalah was stripped naked and taken to interrogation where he was beaten and tortured with electric shock. Mr. Rezkalah is the head of a Coptic Orthodox organization which teaches Coptic Christians about their faith. 6/7/00 Sohag Sourial Gayed Isshak was sentenced to three years of hard labor in prison. The Coptic Christian man was found guilty of “insulting one of the heavenly religions” because of statements he uttered on December 30 in El-Kosheh. Mr. Isshak was the only person sentenced in relation to the El-Kosheh incident ,. The other 4 Muslims charged, their charge were in relation to the killing of a Muslim by another Muslim accidentally and cases of arson outside El-Kosheh. 26/7/00 El-Ayat Coptic Christian Fakhri Ayyad Mus’ad was shot to death when local Muslims discovered he was building a church in a nearby field. Three other men were also injured. 28/8/00 Kaser Rashwan El Fayoum Five hundred Moslems attacked and destroyed a small church at the village of Kaser Rashwan, in the city of Tamyah, El Fayoum province. The rioters also destroyed 7 homes owned by Christians and injured 4 Christians with serious injuries in the village. The incident started when a 13 years old young Moslem boy got in an argument with a Christian young boy who is 12 year old. 6/2/01 The release of the murderers of El-Kosheh Sohag 57 Muslims and 32 Christians stood trial on charges ranging from murder to looting during the violence in El-Kosheh in early January 2000. Twenty-one Christians and one Muslim were killed in El-Kosheh after a dispute between Muslims and Christians escalated. Of thirty-eight Muslims being tried for murder, only four of them received a sentence. The harshest sentence, 10 years imprisonment, was handed down to Mayez Amin Abdel Rahim for “accidental” homicide of a Muslim and possessing an illegal weapon. Three other Muslims were sentenced to less than 3 years each for setting a tractor-trailer on fire. The judge justified the lack of convictions by saying there was not sufficient evidence and it was unclear which suspects had committed which crimes. Instead he laid the responsibility for the violence on three Coptic priests, Fr. Gabriel, Fr. Bessada and Fr. Isaac, for failing to break up the original quarrel. Coptic Christians are outraged by the court’s decision and say this verdict paves the way for more violence against Copts. 5/4/01 Cairo After 5 years a Christian widow continues to battle for custody of her children. The children of Fayza Abd El-Shaheed Tawfiq are considered Muslims because their father had converted to Islam for a period between 1990 and 1995. In 1995 Emad Ayad Bishay returned to the Christian faith and died shortly thereafter. However, because his official identity card listed him as Muslim, his children are also considered Muslims and as such, under law, should be put in the custody of Muslim guardians. 10/2/02 Bani Wellmes, El-Minya A newly built church was attacked by armed Muslims who were angered by the ringing of the church bells. The Church of the Virgin Mary in Bani Wellmes, El-Minya, as well as the 35 homes, were burned during the incident. Several people were also injured as fighting broke out between the Muslim attackers and Christians trying to defend the church. 11/2/02 Bani Wellmes, El-Minya Father Luka Ibrahim Sargious was arrested on the charge of firing a hunting rifle during the incident at Bani Wellmes on February 10, 2002 (see below). However, none of the Muslim attackers were arrested. 19/2/02 Patmos Centre Patmos Christian center 30 kilometers east of Cairo was partially razed by the Egyptian army and several people were beaten, including a teacher whose arm was broken. The Patmos Centre, which serves mentally and handicapped children and orphans, is a legally registered organization that has been functioning for the last 14 years. The Center was also attacked in 1996, 1997 and 2001. 7/5/02 Cairo Hisham Samir Abdel Latif Ibrahim, a Muslim background believer, was arrested in Cairo for falsifying his identity documents and “reviling Islam.” He reportedly changed his religious affiliation from Muslim to Christian by obtaining a new birth certificate under a Christian name. Ibrahim was interrogated for 52 days by the State Security Investigation. 17/2/03 Cairo A female Christian convert and her husband were arrested at the airport as they tried to leave the country. Naglaa Hassan Ibrahim became a Christian in 1996 and later married Malak Gawargios, a Christian. According to authorities they are being imprisoned because of a forged passport and ID card. Naglaa’s passport identifies her a Christian while the ID could not be changed and still lists her as a Muslim. Under Egyptian law Christian men may not marry Muslim women. Thus, Naglaa is being pressured to return to Islam and raise her two children as Muslims. 5/4/03 Patmos Center The Christian-run Patmos Center, a center for physically and mentally handicapped children, was again targeted by Egyptian troops who came in armored vehicles with tear gas and a bulldozer (see February 19, 2002). Workers parked cars in front of the vehicles and laid down in their path to prevent destruction to the center. Patmos Center leaders believe they are being targeted in retaliation for the US war in Iraq. 19/8/03 Red Sea St. Antonious Monastery the Governor of Red Sea Province ordered Central Security Guards units to remove a fence around St. Antonious Coptic Monastery, perhaps the oldest in the world. The wall had been built to protect the monks from Islamic extremists after a previous attack on another Christian monastery and the murder of some monks. Several dozen members of the Security Forces and paramilitary police were involved, using 11 bulldozers and over 20 trucks. 19/9/03 Assiut Central Security Forces in Assiut surrounded the historic St. George’s Church during morning service, stopped people entering and ordered them to leave. Some Coptic groups say that some Guards threw the sacrament on the ground and stepped on it, and several deacons were arrested. 27/9/03 Giza 19 year-old Ingy Nagy Edwar, from Giza, disappeared. When the family complained to the police, they were told that she had converted to Islam and was staying in the house of a Muslim, and the police refused to return her to the family, despite the fact that Egyptian law does not allow a daughter under the age of 21 to marry or convert without the permission of her father. 26/1/04 Saini Four Coptic students, ages 19-20, who had in their possession a number of Bibles and other Christian material were arrested for “disturbing national unity and threatening social peace”. They were detained without trial for over two months before the charges against them were dropped finally and were only freed on 3 April. approached the brink of the Ibrahimiya Canal, Kelani jumped out. Father Mikhael and two other Christians (Mahrous and Nasef) were killed, while the other two remain in a critical condition in hospital. The Officer Ahmed Kelani was sentenced to one year imprisonment for causing death by accident. 30/12/04 Demshaw Hashem-Minia Province Following spread of rumours by Muslims in Demshaw Hashem village that Christians who are a minority in this village were about to turn a house into a church, Muslim fanatics attacked the Christian families in the house, injuring three, one of them died shortly following transfer to hospital. No churches has been allowed so far. 28/6/05 Ibwan village Minya The attack was carried out on Protestant church by local police according to the local pasture Nasser Rushdi Tawadroos report to Alkalema centre on 28/6/05 who reported the police broke the front door under the supervision of the local police chief, the police chief insulted the pasture and his family. Now the church has been allowed to be used but no official permission has been issued. 12/12/05 Kafr Salama Members of Muslim Brotherhood group , attacked the houses, shops and properties of Christians. after a fight between a Christian and a Muslim in the village, during which the father of the latter dropped dead after going into a diabetic coma when he watched the fight.After a meeting between Secretary General of the governorate, NDP and families, a verdict that a compensation of half a million Egyptian pound has to be paid the victim, the family has to leave the village. 18/1/06 UdaysaatLuxor Christians in Udayasaat , heard that they can start praying at an old church which was closed several years earlier. This was followed by a deadly extremist attacks against a group of Copts worshipping at the church the day prayers were suppose to start .It was notable when the province Head of Police came to the church after the Muslim riot and burning started, he threatened and abused the local priest and told the local priest that he came to insured the church is not going to be reopened. One Copt, Kamal Shaker died from a strike of an axe on the back of the head and a child of eight died of chock with at least nineteen other people injured and hospitalized for treatment. 20/2/06 Ezbet Wassef Ghali Basha villageAyat. A decision from the province’s Governor to open the old church for prayers was announced. The radicalized Muslim population started to attack the Christian homes. Police curfew was imposed on Christians only. Muslims of the village caused 14 injuries among the Christians and burned 10 Christians homes and lost several livestock which were burned alive by Muslims, curfew was imposed by police on Christians who were cut off for days. 5/4/06 Faw BahariDishna, sohag 4 houses were burnt, two shops belonging to Christians were looted following a repair to the old Christian Association building which was sanctioned by the authorities. Police arrived with a small number of personnel and was unable to control the riot. 14/4/06 Alexandria churches were attacked in the city of Alexandria. The churches attacked were:- 1. The church of St. George, in Al Hadra.2. The church of St. Mark and St.Peter the Seal of the Martyrs, in Sidi Beshir.3. The church of St. Mary and St. John the Beloved, in Jenaklis.worshippers in the church were surprised by a person carrying two weapons, one in each hand, at the main gate of the church. The attacker started stabbing and slashing worshippers as they were coming out of the main gate, During the attack the attacker was heard to shouting Islamic religious statements. One person was killed, when the perpetrator was arrested and taken to court, he was described him as being ‘mentally unstable’ he was put in mental asylum. 27/6/06 Zakazik Fouad Fawzi Tawfik was murdered in cold blood in his shop at the hands of an ex convict Muslim fundamentalist who stabbed him several times, uttered some Islamic religious verses and left the shop. 15/9/06 Saft Ellaban Minya Mamdouh Hanna Tawadros was killed by Muslim fanatics Mohammed Nazim Abulqader who changed the irrigation canal dirction to his land depriving Mamdouh. Mamdouh complained to Mohammed but Mohammed did not take notice, them Mamdouh complained to the police who questioned Mohammed, who decided to kill Mamdouh, the murder took place in the middle of the village by Mohammed and 3 of his relatives. 9/3/07 Cairo,Imbaba Atta Attia and his son Magdy, were gunned down in front of their home by a group of Muslims who were waiting to murder them. The District Attorney investigating the case did not prosecute any of the Muslim attackers, but rather accused Attia's second son, Essmat, of carrying a weapon, even though no weapon was found. As usual, the Egyptian authorities sought to protect the perpetrators and punish the victims. 04/06/07 El-Mahala El-Kobra Amir Abdula Andrawis (Teacher-28 years old) was killed in the city of El Mahala El Koubra by 26 fatal stabs. The killer, Mahmoud Kamal Mahmoud Elzayat (Furniture maker- 27 years old) is the son of the house owner where Amir’s family lives. This murder happened as Mahmoud Kamal Mahmoud Elzayat wanted to force Amir’s family to leave the flat in the house the Muslim Family owned. Although this attack was NOT part of a campaign but it shows how Christian life is cheap in Egypt and Christians could be easily killed for trivial reasons. 25/2/08 Bashteel Moa'wad Fadl 33y the only son was slaughtered in his jewellay shop in mid day by a Muslim fundamentalist and veiled women. Police failed to find the perpitrators. 01/05/08 Maghagha Nabil Zaki was murdered at the hands of large crowd of 35 Muslim fanatics because Nabil Failed to get permission to collect his crops from his own land. 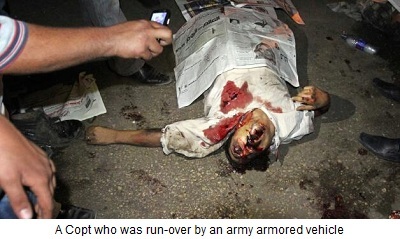 05/06/08 Dafash, Minya Milad Farag, a 23-year-old Copt, was stabbed by a 22-year-old Muslim Khamis Eid. The murded of a Christian in Egypt is not taken seriously by the Egyptian police, most attacks goes unpunished and a false pretext given. 09/10/08 El-Tayaba Samallout district Minya province Yeshua Gamal Nashed 27-year-old was killed in cold blood by a stray bullet as fighting brook out in the village. A staged fight between two Muslim families and an attempt to beak into a timber warehouse own by a Christian who prevented Muslim mobs from using his time in the fight was followed by attacks on Christian houses and shops, one chemist where some Christian houses wre set a light. Sabri Shihata 25y was burned alive by Yasser Ahmed Qasim for allegedly having a relatioship with his sister. Sabri's father 60y was later stabbed to death by a mob of Muslim fanatics. 11/03/09 Kafr Naiem, Benha 28-year-old Copt Wagih Maurice Barzi body was found floating on the waters of the Nile. The male body's feet and hands were tied with rope in a squat position, and his face and head bandaged.The heinous crime was committed by a Muslim killer who posed as a police officer, deluded his partners in crime under the pretext that his sister was harassed by the Coptic victim. Farouk Henry Attallah, 61 was shot dead while walking in the village. the murder was prompted by rumours that Attallah's son had taken intimate pictures of a muslim girl and distributed them through cellular phones and CDs, the killers fired 31 bullets to his head before beheading him, all his 4 murderers were aquitted on 22/2/10 by Dairout Criminal court. As Copts were leaving church following mid night Christmas mass Three men in a car sprayed automatic gunfire into a crowd of churchgoers in southern Egypt as they left a midnight Mass for Coptic Christmas, killing at least seven people in a drive-by shooting, the names of the martyers are Abanob Kamal Nashed, Bola Atef, Rafik Refat, Ayman Zakaria, Mina Helmy, Bishoy Samuel two be followed be other two died later from their wound. 19/02/2010 Teta, Menoufia Malak Saad 25 years old was shot dead by the guard used the bathroom inside the meeting hall aapparantly as he had come outside of the building when he exchanged a few words with Saad and shot him at close range. The government sources lied by saying the death was accidental as the guard was cleaning his rifle. Two demonstrators were killed and dozens injured on Wednesday as Coptic Christian protesters clashed with Egyptian police over the denial of permission for a new church, a security official said. A security official told AFP a young male protestor was killed during the protests and that a senior police officer was among the injured. The dead protester was identified as Makarios Gad Shukr, 19. A second man was killed following the al-Omraneyya church riots on Wednesday, after he was shot in the stomach. Milad Malak Soliman, who died on Friday, was hospitalized in al-Haram district, after he was shot on Wednesday. The police ordered the autopsy of the body. 01/01/11 Alexandria, Al-Qidiseen church. At least 21 dead and more than 70 injured after bomb explodes outside al-Qidiseen Coptic church in Alexandria the number of killed rose to 23 the killing was intially blamed on a car bomb but later the government blamed suicide bomber to make the killing blamed on Al-Qaeda video of the burging car with nearby people shouting allahakbar..
11/01/2011 Samalot-Minya An off-duty policeman boarded a train and opened fire on Tuesday, killing a 71-year-old Christian man and wounding his wife and four others, the Interior Ministry said. The attack, less than two weeks after the suicide bombing of a church killed 21, sparked new demonstrations by enraged Christians who pelted police with stones in southern Egypt. 24/01/2011 Omraniya, Giza Two demonstrators were killed and dozens injured on Wednesday as Coptic Christian protesters clashed with Egyptian police over the denial of permission for a new church, a security official said. A security official told AFP a young male protestor was killed during the protests and that a senior police officer was among the injured. 30/01/11 Sharona Minya 11 people from the same family were killed at the hands of a Muslim mob Two Islamists groups, aided by the Muslim neighbors, descended on the roof of houses owned by Copts, killing eleven Copts, including children, and seriously injuring four others. Series of attacks took place against Coptic Christian churches in Imbaba the attacks began when the Salafis atorched the Coptic Orthodox church of Saint Mina, where they alleged a Christian woman was being held against her will because she wanted to convert to Islam. 15 people were killed in the attacks, and about 232 injured. Apartments and shops belonging to the Christians were also torched and destroyed. Salafies went on to attach St Mary Church in the same area. Ayman Nabil Labib was murdered at school by classmates at Malawi Al-Tagribia secondry school because he was wearing crusifix, he refused to take off his crucifix . “The teacher nearly choked my son and some Muslim students joined in the beating,” said his mother. Angry Muslims murdered two Christian brothers, Kamel Tamer Ibrahim (55) and Kameel Tamer Ibrahim (50) as well as some Salafists torched a store and the home of a Copt. 26/01/12 Bahgourah Two Copts were killed in the village of Bahgourah, a suburb of Nag Hammadi after a Muslim racketeer opened fire on them for refusing to pay him extortion money.Coptic building contractor Moawad Asaad and his son Assad both were killed instantly. 17/05/13 Dekheila-Alexandria Sedky Sherif (36) died in the violence that broke out in the Dakhela district of Alexandria on 17 May. Muslims launched an attack on a church after an accusation was made against a local Christian man. Horrific murder of 5 Christians in cold blood took place one of a priest in North Saini and 4 in Luxor, Emil Naseem Saroufeem, 42 was supporter of Tamarod who ousted Morsi from presidency, was chased by Muslim Brothers supporters and escaped briefly when two relatives, Mouhareb Noushy Habib, 38, and Romany Noushy, 33, hid him The rabble caught up with the three Christians in the apartment of Rasem Tawadrous Aqladios, 56. Saroufeem and Aqladios were bludgeoned to death. The other two, Habib and Noushy, died when they were beaten and repeatedly stabbed. Muslim militants fired bullets at the house of Emad Damian, 50, while he was at home with his cousin Medhat Damian, 37, in the village of Sahel Selim in Assuit Province. Both men died in the September 12 attack. Two days before the shooting, Emad reportedly received a phone call from Ashraf Ahmed Mohammed Khalajah, described by villagers as "a Muslim gang leader and registered criminal." 21/10/13 Waraq-Cairo Cairo — Gunmen on a motorbike shot dead three people late Sunday, including an eight-year-old girl, as they fired on a group outside a Coptic Christian church in Cairo, Egypt's interior ministry said. The attack was the first such assault targeting Christians in the Egyptian capital since the military coup that ousted Islamist president Mohamed Morsi on July 3. The following day the numbers of dead increased to 4. “A young Coptic Christian man has died from gunshot injuries in Egypt’s capital Cairo, after three local hospitals turned him away, Christians said Tuesday, January 6. Ihab Ghattas, 23, reportedly died on New Year’s Eve from a gunshot wound to the head because of ‘negligence’ as the hospitals which refused to treat him, said Copts activist group Maspero Youth Union (MYU). 28/03/14 Ain-Shams Cairo Killed by Muslim Brotherhood. During Muslim Brotherhood demo , Mary Sameh George was identified as Christian by the cross she was wearing. After Dragging Her From Car she was stabed several times in her neck and shot in the head. English teacher Ashraf Atef Hanna shot by the teenage brother of one of his students at Marzouk Prep School in the village of Marzouk in Minya Province, succumbed to injuries from the shooting on Tuesday (April 8).According to human rights activists and local media sources, the teacher caught one of his students smoking in class. When the teacher told the boy to stop smoking, the Muslim student cursed at the teacher and insulted him in front of class. The student later returned to the school with his family, which area residents said has ties to local Islamic extremist groups. The group chased the teacher through the school, and after catching him, they beat him and shot him once in the head.